This protocol can be used to purify AAV of any serotype. In medicine, iodixanol can be used as an intravenous isomolar contrast agent. In research, iodixanol is used as an isomolar density gradient medium suitable for virus purification and isolation of cells, organelles, lipoproteins, and macromolecules. Importantly, iodixanol is inert and non-toxic to mammalian cells. Therefore, and unlike other density gradient media, it is reportedly not necessary to remove iodixanol prior to use of your purified virus. Nonetheless, we recommend performing a buffer exchange before using the purified AAV in vivo . The iodixanol gradient in this protocol is composed of steps that separate out contaminants from an impure AAV preparation. The 15% iodixanol step has 1M NaCl to destabilize ionic interactions between macromolecules. The 40% and 25% steps are used to remove contaminants with lower densities, including empty capsids. The 60% step serves as a cushion for genome-containing virions. Phenol red is added to clearly distinguish the steps. This method will help enrich the prep with full (genome containing) particles. On average, iodixanol-purified AAV preparations contain ~20% empty particles. 60% iodixanol solution is available under the name OptiPrep from Sigma-Aldrich. Note: Both steps could be completed in one (long) day. Dissolve 5.84 g of NaCl, 26.3 mg of MgCl2and 14.91 mg of KCl in 1× PBS in a final volume of 100 mL. Sterilize by passing through a 0.22-μm filter and store at 4 ℃. 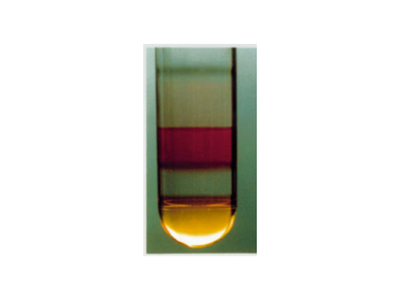 Dissolve 26.3 mg of MgCl2, and 14.91 mg of KCl in 1× PBS in a final volume of 100 mL. Sterilize by passing through a 0.22-μm filter and store at 4 ℃. Add 5 μL of 100X Pluronic F-68 to 49.95 mL of PBS. Store at 4 ℃ for up to one month, or aliquot and store at -80 ℃ for up to one year. 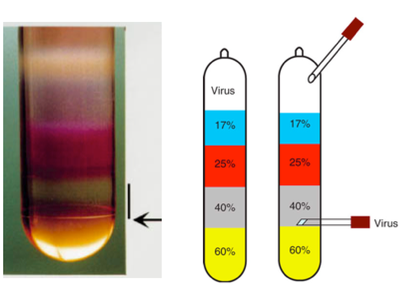 Overlay each solution into a QuickSeal tube in the order below using a 10 mL syringe and an 18 g needle, taking care to avoid bubbles (Figure 1). Carefully add up to 5 mL of clarified supernatant on top of the gradient. Use 1x PBS (or cell lysis buffer) to top off the tube. Centrifuge at 350,000 g for 90 min in a T70i rotor at 10 ℃. *Pro-Tip* If you need more time, you can alternatively centrifuge for 2 h at 200,000 g at 18 ℃. Prepare a row of roughly 20 open 1.5 mL microcentrifuge tubes in a rack. These will be used to collect fractions from the gradient. You can collect fewer fractions once you have a good idea when the virus elutes from the gradients. In a biosafety cabinet, carefully puncture the QuickSeal tube at the interface of the 60% and 40% gradient (see Figure 2) with an 18 g needle. Place the first microcentrifuge tube under the needle’s opening to collect the fractions. Puncture the top of the QuickSeal tube with a 16 ga needle and start collecting 0.5 mL to 1 mL fractions per tube. Avoid the proteinaceous material near the 40-25% interface. *Pro-Tip* As soon as the top of the tube is punctured, AAV-containing Iodixanol solution will flow from the needle set at the 40-60% interface. Make sure that the microcentrifuge tubes are well positioned to collect the solution or you will lose a significant amount of your virus. When the first fraction is collected, move the rack to the next empty tube to collect the next fraction. The flow will be rapid at first and will progressively slow down. Puncture the QuickSeal tube at the bottom using an 18 g needle. Immediately start collecting 0.5 to 1 mL fractions in microcentrifuge tubes. Repeat for each QuickSeal tube. The first 8 mL collected corresponds to the 60% phase and can be discarded. The fractions obtained from the 40% phase contain the purified AAV. Puncture the QuickSeal tube slightly below the 60-40% interface with an 18 g needle attached to a 10 mL syringe. The bevel of the needle should be up, facing the 40% step. Collect up to 5 mL per tube, taking care to avoid collecting the proteinaceous material at the 40-25% interface. (Optional) For first time users, it is a good idea to assay each fraction by silver stain to determine purity. Only the cleanest fractions should be kept and pooled for dialysis. Take out the 0.1% Pluronic F68 PBS and add 15 ml of 0.01% Pluronic F68 PBS. Discard the flow through and add 15 ml of 0.001% Pluronic F68 + 200mM NaCl PBS. Spin at RPM rpm for 5 min at 4 ℃. Discard the flow through and add your sample. Spin at 3500 RPM for 8 min at 4 ℃, discard the flow through. Add more sample and spin 3500 rpm for 4 min at 4°C, discard the flow through. Repeat this step as needed. Please note that iodixanol is not easily removed. After each spin, add more formulation buffer and sample and make sure to pipet back and forth a few times to mix the iodixanol that has settled at the bottom of the column. We recommend concentrating to a minimum of 500 µl. If the concentrate volume is less than 500 µl, bring up the volume with formulation buffer. Use a P1000 to the bottom of the filter and pipette up/down and wash off the walls of the filter to recover as much virus as possible. Store at 4 ℃ for short term (2 weeks), or aliquot and store at -80 ℃ for long term. Figure 1: Iodixanol gradient before ultracentrifugation. The steps are clearly distinguishable thanks to the use of phenol red. Image adapted from Zolotukhin, S., et al. "Recombinant adeno-associated virus purification using novel methods improves infectious titer and yield." Gene therapy 6.6 (1999): 973-985. Figure 2: Left panel: Iodixanol gradient after ultracentrifugation. The arrow indicates the 60-40% interface. The vertical black line indicates the location of the purified AAV. Left image adapted from Zolotukhin, S., et al. "Recombinant adeno-associated virus purification using novel methods improves infectious titer and yield." Gene therapy 6.6 (1999): 973-985 . Right panel: cartoon indicating the position of the needle for harvesting of the purified AAV using option #1. Right image adapted by permission from Macmillan Publishers Ltd: Nature Protocols Grieger, Joshua C., Vivian W. Choi, and R. Jude Samulski. "Production and characterization of adeno-associated viral vectors," copyright (2006). 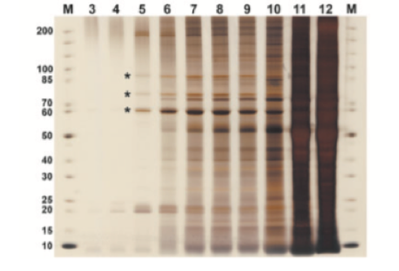 Figure 3: Example of an SDS-PAGE gel of 10 consecutive gradient fractions followed by silver stain. Note the increased number of contaminants in each fraction. * AAV capsid proteins VP1, VP2, VP3; M protein marker. Image adapted from Strobel Benjamin, Miller Felix D., Rist Wolfgang, and Lamla Thorsten. Human Gene Therapy Methods. August 2015, 26(4): 147-157. doi:10.1089/hgtb.2015.051.